The Dynamo club championships: racers and non-racers, united. And not arguing. You know me, reader. You know the sort of person I am. I’m an honest man, and I will always endeavour to give you the unvarnished truth. So I feel I can tell you that London Dynamo hasn’t been travelling a smooth road lately. Behind the walled city of our members-only forum, a few ’Mos have loudly complained that the club has lost its focus. Dynamo finished a mere sixth in the Surrey League last year – please, hold back your tears – and some of our more experienced racers feel the club’s racing culture has been eroded as more sportive riders have flooded in. Despite my fondness for a good old ding-dong, I’m not too bothered by this contretemps. A lot of our big Surrey League point-scorers stopped racing for the club because they moved out of London or had kids. 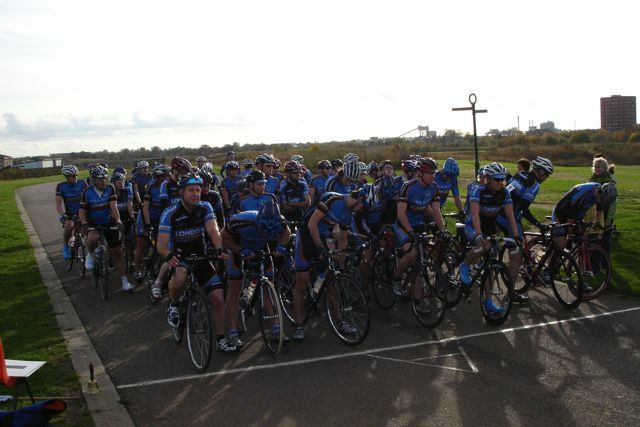 But a healthy number of newer members are going to Hillingdon to try out racing at the Imperial Winter Series, and more riders will make the transition from sportives to road racing. You’ve just got to give it time. Nevertheless, the issue of how to handle the club’s ever-expanding size is likely to provide animated discussion at this year’s AGM, which takes place tomorrow. Some disillusioned members might not come along to join in with the arguments because they have decided not to renew their memberships. But it is notable that many more haven’t already left. Veteran club cyclist Tim Hilton, in his charming, freewheeling cultural history One More Kilometre And We’re In The Showers, observed that any cycling club’s maximum number of members was usually around 100. “The history of British cycling tells us that defections will occur, or a formal split, if this number is exceeded.” London Dynamo reached Hilton’s benchmark within 12 months, and by the end of 2012 – its ninth year – there were 560 paid-up members. And these days there isn’t an imperative to join a cycling club in the first place. With GPS devices, newcomers to the sport can easily discover and navigate training rides themselves. Personal trainers can provide you with a training plan, or you can filch knowledge from books, magazines and the internet to create your own. You could even learn the basics of roadcraft from YouTube. In this context, London Dynamo and other large clubs should be the HMVs of the cycling world, lumbering beasts struggling to adapt to the digital age. But instead of facing extinction or decline, membership numbers in most large clubs I know of are rising or remain high. Strava’s virtual club runs haven’t made a dent in the popularity of our rides, and the Rapha Rendezvous app, which aimed to connect users looking for others to ride with them, quietly disappeared some time during the past year. So why are cycling clubs doing so well? I think the fundamental reason is that cycling can be bloody miserable. Before reaching the sunlit uplands of peak fitness, you must endure scores of desultory, rain-soaked miles, so it helps if you can be among a large group of people offering each other moral support along the way. The other key reason is the randomness: you can turn up week after week for a club run and never know exactly who you’re going to meet. 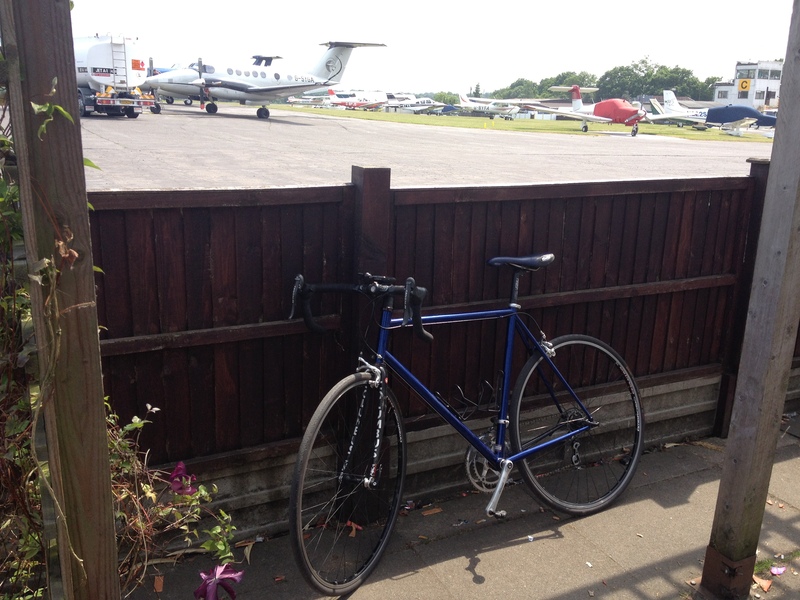 A big club like ours can be a new club, or at least a slightly different one, every time you turn up for a ride. But you can’t have amity without enmity, which is why I value the sometimes vociferous debates that take place within Dynamo, and the wide differences between members’ participation in the sport. The club will never be just a load of stats and info on a screen; we’re a living entity, and arguments are a sign of life, however ugly. On the subject of extraordinary images, The DYNAMITE! Files can well imagine an old, creaking wooden ship conveying Cadel Evans across the seas like an exotic spice to deliver him to his homeland. In truth, however, the gap of almost two weeks between the Cuddlator winning the Tour de France and his triumphant return to Melbourne on Friday could probably be explained by the round of criteriums and sponsor-related obligations that are usually part of a champion’s lot. 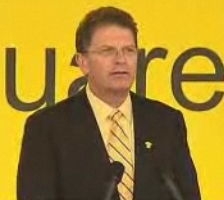 That 12-day period appears to have been long enough for local politician Ted Baillieu to dispense with the notion that yellow is a hard colour to wear, especially if you’re standing next to a man who earned the right to adorn himself with that same hue by winning the hardest race in the world. But Ted Baillieu’s yellow shirt and yellow tie combo has now set a fantastic precedent: if, in 12 months’ time, Nick Clegg isn’t standing outside number 10 in a gold lamé suit shaking the hand of new Olympic champion Mark Cavendish, then it will be a major breach of protocol. Mark our words. Returning to the festival of fun that was the London-Surrey Cycle Classic, it is fitting that the Olympic route encompasses Richmond Park, the unofficial home of London cycling. It is a democratic arena which welcomes the young and the old, the whippets and the whupped alike – so well done to the anonymous, Assos-clad fella who somehow smuggled himself into the peloton to proudly represent the body shape of the less sporty park user. Not even the stares of the nonplussed pros could diminish his jollity. Bravo, sir! What was the “INCREDIBLE news” Mark Cavendish received from David Millar shortly after the Manxman won on the Mall? Has Millar’s autobiography reached the top spot in the Waterstone’s chart? Have the two raconteurs agreed to do a series of head-to-head banterthons, in the style of Alas Smith And Jones? Or is the Scotsman really having Cav’s baby? Here’s our theory: the Manxman is off to Garmin-Cervelo because Sky was unable to match Jonathan Vaughters’ offer of an unlimited supply of his favourite sausages. You heard it here first, chums. Never heard of former breakfast TV gawp magnet Zora Suleman? You’re not alone, because The DYNAMITE! Files was also unaware of her existence until she interposed herself between the considerable bulk of her chum Eamonn Holmes and the righteous ire of tweeting cyclepeople. The row began when sofa-dwelling Eamonn blamed “flamin Olympic bikes”, rather than his inability to plan ahead and make alternative travel plans, for preventing him from driving to a village fete. “Keep sport in a stadium,” he grumbled from a traffic jam on the A3 – presumably with his engine turned off, otherwise that tweet, made from his BlackBerry, is technically an offence. Given that he recently succeeded in banning mentions of his weight from a BBC comedy show, his petulance on this occasion was perhaps not entirely out of character, and he was soon rewarded with robust responses from bike racing fans all over the country (most of them retweeted by Surrey League organiser Ken Prince.) It was pointed out to the Sky presenter that he might not be singing from the same hymn sheet as his employers, who are sponsors of the British cycling team, and many people would expect a public figure to support one of the few events Britain has a chance to win gold in next year, even if the trial run does interrupt his Sunday afternoon drive. And, of course, stadium sports are a regular cause of traffic anyway, as anyone who lives near a London football ground can attest. But it was glamourous newsgatherer Ms Suleman who provided a bizarre denouement to proceedings by claiming she had been “inundated with calls” from irate members of the public who had not heard about the road closures and diversions. Well, no one claimed there wouldn’t be a few people who had escaped the reach of the TfL publicity machine, which had warned of delays for weeks. But “inundated”? Even the Daily Mail, hardly the most bike-friendly news outlet, could only attest to “some” drivers being put out. So which news outlets were “inundated” with calls? None, it seems: after being pressed, Zora admitted she is currently unemployed, and then deleted the offending tweets – although you can still see them here and here. Let’s just hope Eamonn appreciated all the hard work she put in sticking up for him!